NYSHA has offered number of all day workshops for police officers through out New York State. The evaluations by the police officers are very positive and indicate the police officers have learned a great deal about anti-cruelty laws, to recognize and be sensitive to acts of cruetly, when to act immediately to prevent/ stop animal suffering. 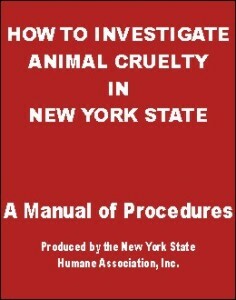 Hopefully the participants are aware of the tremendous resource provided by NYSHA online: The manual How to Investigate Animal Cruelty in NY State – A Manual of Procedures is available on the NYSHA’s website at in both html and pdf formats. This manual provides information on NYS anti cruelty laws, case studies, sample forms such as application for search warrant, etc. We would like to get more feedback from the police officers on what NYSHA can do to help police officers address animal cruelty. Police officers are encouraged to respond to this post to offer their thoughts and suggestions. Thank you. Great website and manual is well written and organized.